Carbon fiber composites are nothing new in aerospace. They’re being used increasingly in aircraft, satellite launchers, and spacecraft. What is new is their use in a satellite’s fuel tank that has been designed to burn up on re-entry. The Propulsion Branch of NASA’s Goddard Space Flight Center has developed and tested the first spacecraft fuel tank that will fall apart completely and harmlessly when it re-enters the Earth’s atmosphere. This tank is designed to reduce the amount of debris falling to the Earth’s surface. Instead of needing to carry additional fuel to reposition for re-entry, a satellite could operate on a much simpler propellant tank, or it could do without one entirely. The craft itself could also be much lighter (allowing for a larger payload), and it could last longer on the fuel it does carry.NASA has been pursuing Design for Demise (D4D) spacecraft systems for several years. One of the major barriers has been designing a propellant tank that constitutes between 10 and 20 percent of the total debris cast off from a craft re-entering Earth’s atmosphere. The new tank was designed, developed, and qualified by Cobham Life Support and represents a major achievement in this pursuit. It integrates carbon fiber composites with an aluminum liner, and it holds up to 1,600 pounds of hydrazine fuel at 400 psig. The tank was originally designed for the core satellite in NASA’s Global Precipitation Measurement (GPM) mission. 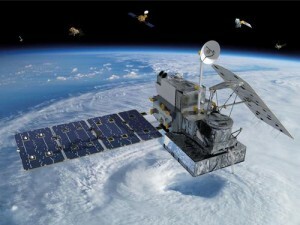 The GPM Core Observatory Satellite and an international network of partner satellites, currently under construction at the Goddard Center, will measure rain and snow around the world every three hours. The frequent measurements are expected to help us improve weather forecasting, gather accurate climate change data, and understand how the planet’s water and energy cycles affect the environment. NASA’s main partner in this project, the Japanese Aerospace Exploration Agency, will launch the core satellite next year. According to an article in a Goddard Center newsletter, the tank’s key innovations are an aluminum-lined composite overwrap pressure vessel and a highly wettable aluminum propulsion management device (PMD). The device has wicking properties very close to those used with standard titanium tanks. But titanium doesn’t get hot enough during re-entry to disintegrate. That was one of the sticking points in efforts to build demiseable propellant tanks. By reducing the amount of fuel required, the new tank design contributes to an effort by the center’s Propulsion Branch to find greener technologies. For example, many satellite fuel tanks use hydrazine propellant, but the branch is looking at safer, higher-performing fuels.Cobham Life Support makes composite propellant and pressurant tanks, as well as propulsion systems for spacecraft. Previously, it designed the biggest composite xenon propellant tank, holding 992 pounds of xenon at 1,250 psig at launch. That carbon composite pressure vessel, lined with titanium, weighs less than 49 pounds, including the entire tank and skirt assembly. The tank is light enough to be integrated with the spacecraft structure.Cobham makes other composite-metal hybrid structures, including aspirators, launch tubes, rocket motor cases, torque tubes, and drive shafts. Its integrated systems include helium pressurization systems and oxygen and nitrogen pneumatic life support systems.